Merry Christmas! Oh wait...it's only July, and it's surely not cold here, but I have Christmas on the brain, as you will see. It's another sunny Saturday though...been so hot this week... and that means it's time for another challenge in the new Compendium of Curiosities III Challenge!!! Thanks for all Frosted Film entries in the last challenge...talk about gorgeous! You all rocked it! Thank you for joining us, and for all the wonderful comments and such! The Curiosity Crew and I am always so happy by what we see! This new challenge, number thirty-three (ONE MORE TO GO!) is using the Altered Surfaces Technique. This one is sure to be a favorite...I know it was for me! You will love the results of this...I just know it! Please play along so you can win some fabulous prizes donated by the ever generous Tim and Mario, and this challenge's sponsor, Inspiration Emporium!!! You will have two weeks to complete this challenge and link it up to the CC3Challenge site, and you can read all the rules here. Please take the time to visit every member of the Curiosity Crew (See below.) for not only some altered surfaces inspiration, but for a chance to win some extra goodies! A few weeks ago, Charyn Deiling, again gave me another challenge (Remember the first one?). 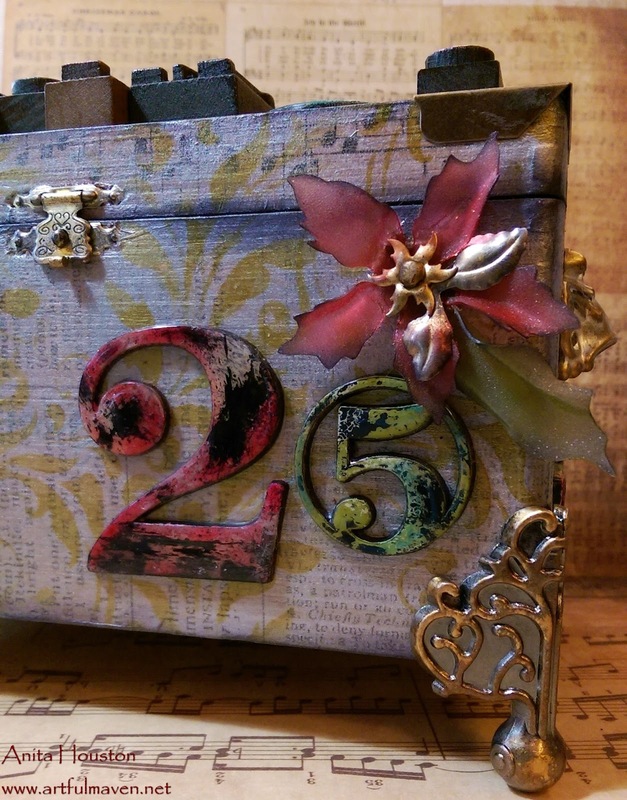 She wanted me to use a cigar box she found for a project. I have been so inspired by so many of you out there blogging about your Christmas in July projects, so I decided to play with some holiday goodies too. I loved the box as it was...gorgeous, but after this Christmas Altered Surfaces redo, I love it even more. Thanks Charyn for thinking of me...again! And, thanks Tim for all the techniques and goods to use! I wrapped, painted, stenciled, glued, inked, did the technique on the Alpha Parts and Letterpress pieces, and managed to make poinsettias using the last challenges technique with the Frosted Film. 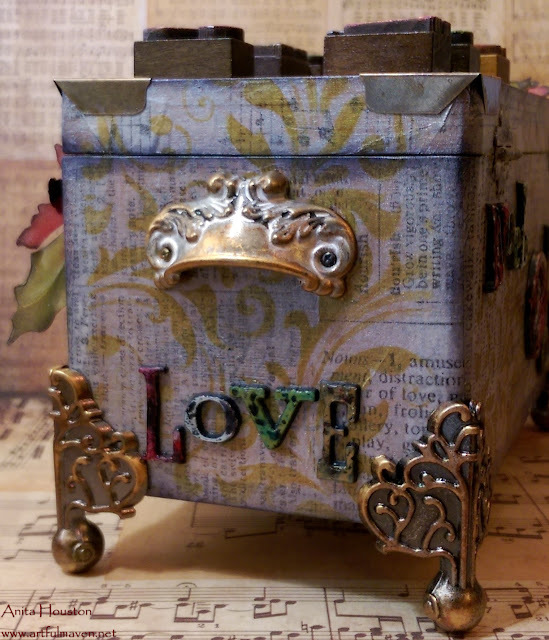 This box was so so so fun to make! I left the inside as it was, because I loved the smell of the box. Strange I know!!! I will probably fill it with Christmas candy. 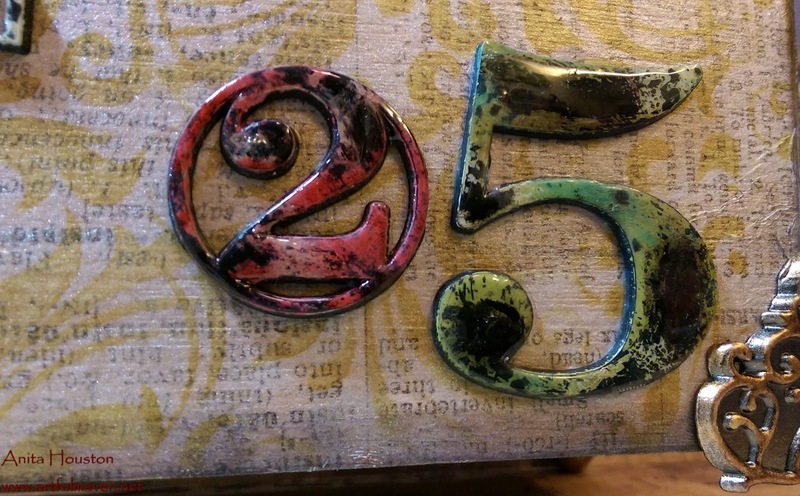 This technique is fabulous, and works on so many surfaces! I truly hope you get to play along. And, if you have been with us the whole time, then you probably know what is coming up for the last challenge...sshhhh...don't tell! I can't believe how the time has flown by. Oh, I love this! Those poinsettias made with frosted film are just heavenly! The colors are so soft! All the wonderful touches of gold and the beautiful red and green...this glorious altered cigar box belongs in Santa's workshop! I love it! Your box is absolutely beautiful! 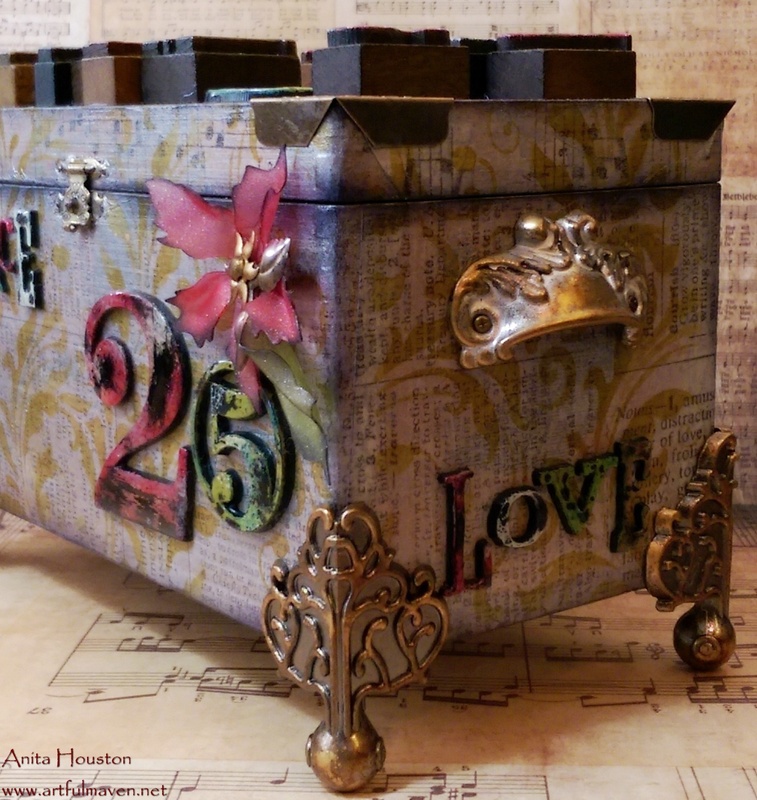 Beautiful transformation of your cigar box, Anita! Every altered surface looks fantastic. Your frosted film poinsettias are beautiful. 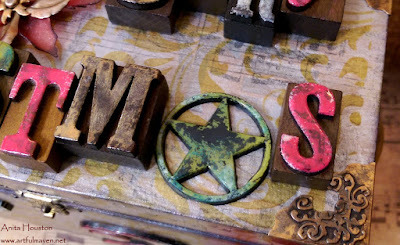 Each of your letterpress letters are so pretty and give a wonderful vintage quality to your box. It is all so beautifully done. This is the BEST cigar box ever !!! ACK! LOVE your box! 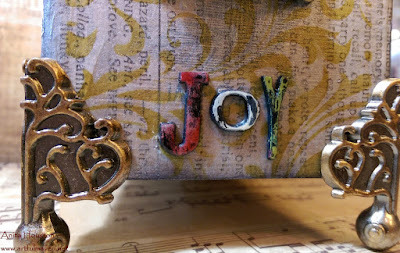 I love the way you used the technique on the letter press blocks! Fabulous!!! This box is amazing, a great piece of decor for the holiday season...even though I am SO not ready to start thinking about that, wink. Big hugs sweets! 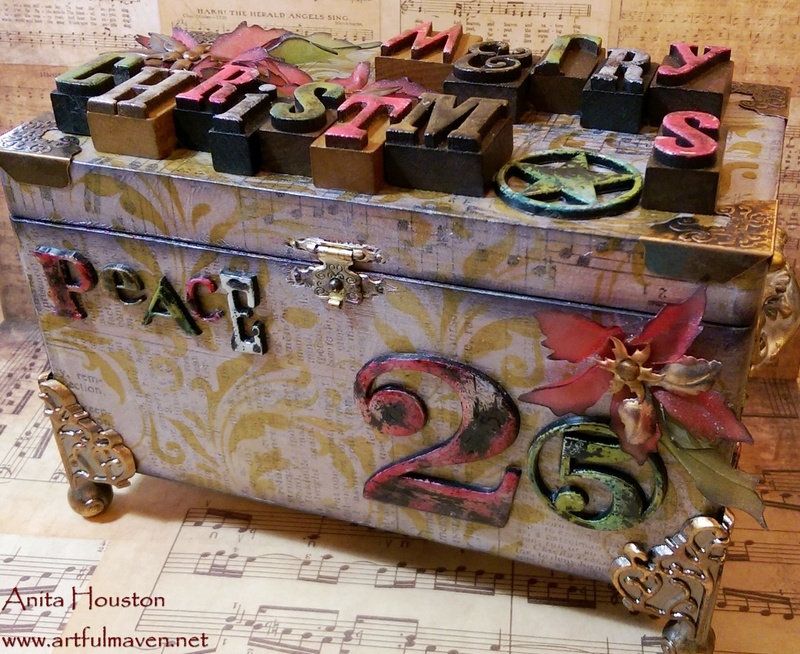 Delightful Christmas box, love your stenciled tissue background and all of your altered pieces. Anita, this is SOOOOO pretty! I love your Frosted Film poinsettias; what a lovely touch. I'm a bit of an alphabet freak (at least 30 alphabet stamp sets and probably 50 sets of alpha stickers and die cuts! ), so this zaps me right where it counts. It's going to be awesome filled with delicious candy for the holidays! Now I want to break out the Christmas decorations. 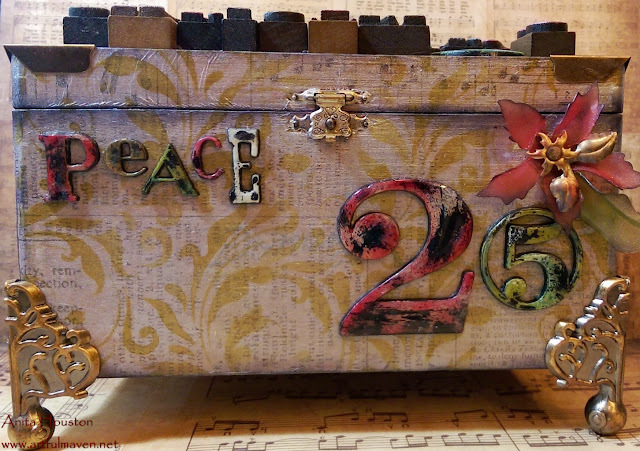 This is a gorgeous Christmas box. Love it. 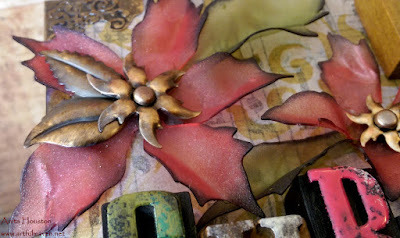 The frosted poinsettias are so beautiful and I love the altered surfaces too! Great details all around. Lovely! I love what you've created here! You really outdid yourself. Anita, as always, amazing design and techniques. You made such a beautiful Christmas in Juky box. I love it. So many altered surfaces and details. Anita, you are just awesome! WOWZERS! This is one fantastic box, I think Christmas is rolled up right inside! Love the Christmas in July idea ... Your box is awesome ! Love how you combined the use of alpha parts and letter press . The frosted poinsettias and the festive foliage are fantastic together ... I love it !!! Cigar scented candy... yum? LOL! This box is fantastic, girl! You really showcased the technique on all those letters and parts. Love how you subbed the J for the second R and used the star for the A in Christmas. Clever girl! The top of the box is MY favorite too. Those poinsettias are fabulous!! You're always so inspiring. I think I like the top best as well! Love those poinsettias! Oh wowzer! 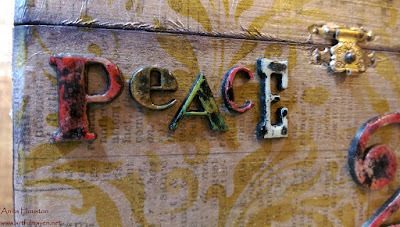 All your letters and numbers look just insanely gorgeous - and the whole piece is a triumph - fabulous! What a beautiful box! Lots of luxurious detail in there! Now you make me want to go start on Christmas crafting! Oh Anita! The beauty in your pieces is awe-inspiring! I wish I could go to a store and purchase this piece right now! I absolutely love it!!!! Boy, Anita, this box is amazing! Love how you altered all the letters and numbers, especially the letterpress letters! Fabulous job! The poinsettia is incredible too - love that soft look. 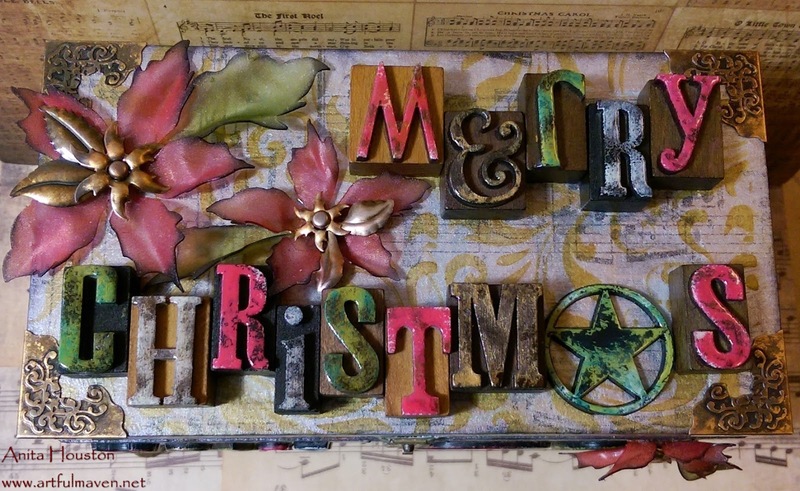 It will make a wonderful decor box at Christmas! although i am so not ready to see anything Christmas yet i am freakin LOVIN this!!!! as always fabulous job my friend! Knocked it out of the park!!! This box is Beautifully Amazing!! All the sides a great but I love the top!! The flowers, the letters, all the metal pieces!! Inspired! Pulling out a cigar box now. It's hard to think of Christmas when it's 89 degrees at 11:10 pm though!! So many surfaces, so little time, hee hee. Crushing on this Christmas box. The stamping on the tissue wrap was a nice touch. 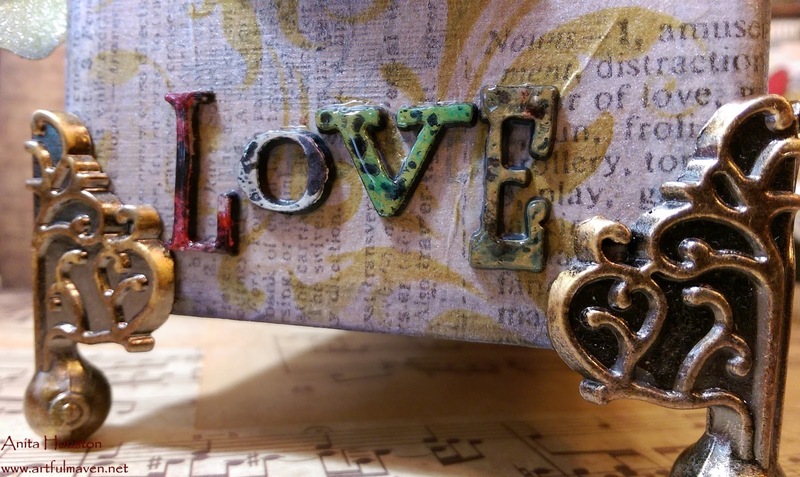 Love that you altered a variety of surfaces and were able to include them all in one project. This is just STUNNING, I saw it while I was on holiday but the internet was so bad I had to wait till I got home to tell you how wonderful this is.......This is Wonderful! Christmas in July! 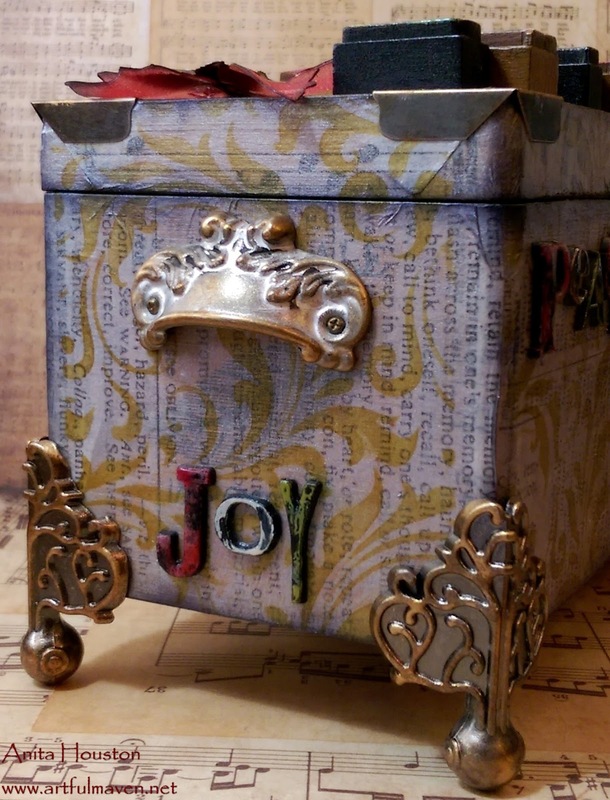 Really cute Christmas box. Love the Poinsettia. Not even ready to think about Christmas - whew but.... I might be if I had this INCREDIBLY BEAUTIFUL chest to look forward to putting out Anita. And dear me - your altered surfaces... so many and so PERFECTLY done... in many colors... I am in awe. Seriously your creations is just GORGEOUS. j.
Anita, this is over the top gorgeous!! I just love how your creative brain works! Wow, Anita! 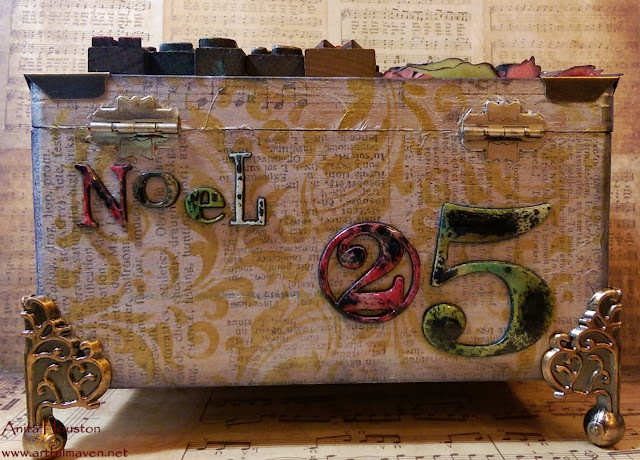 You have really outdone yourself with this fabulous Christmas box! I love those frosted film poinsettias, and your altered surfaces are just so cool! 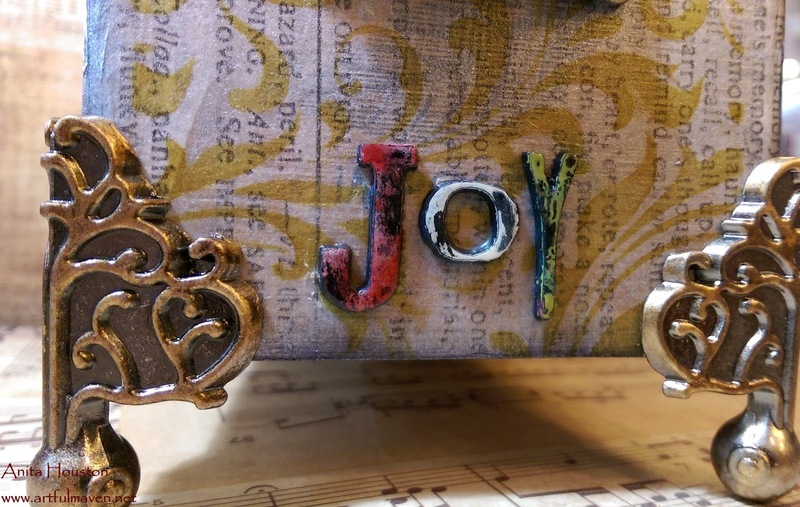 You are amazing to be able to create for Christmas in July! Hugs! I love all that Christmas goodness Anita! Definitely a project I want to make, this is phenomenal Anita!!! You've done it again! Great project! That stenciling and metal work is awesome!